The Institute realized the importance of diversity of biological forms and their importance in maintaining the ecological balance right from the inception of the Institute when it established Herbarium Cryptogamae Indiae Orientalis (HCIO) with more than 6000 specimens and a National Pusa Insect Collection in 1905 which has more than 5 lakh insect specimens. 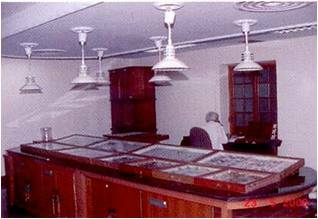 Later on, an Indian Type Culture Collection of Fungi (1936) which has more than 3300 live fungal cultures, a National Collection of Nematodes (1969) and a National Rhizobial Collection (1986) were also established. These collections are national wealth and very useful resources for undertaking taxonomic studies. The Institute has also developed a National Facility for Conservation and Utilization of Blue Green Algae and Azolla. In addition to these collections, IARI has also a large germplasm collection of food, fodder, vegetable and fruit crops. The Seed Testing Laboratory of the Institute has got the status of CSTL under the Ministry of Agriculture and serves as a Referral Laboratory for all the 96 seed testing labs located in different parts of the country. Regular training programs for the personnel of the State Seed Testing Labs are being organized. The Institute also developed a big complex providing state of the art facility for protected horticulture under Indo- Israeli collaboration in the year 1998. This facility is extremely useful for students and scientists of horticulture and provides a model for efficient agriculture. National Pesticide Referral Laboratory was established under Team of Excellence, National Agricultural Technology Project in 2002. The etablishment of this laboratory is a step towards global competitiveness in generating reliable data, ensuring quality produce, export certification and developing human resources in pesticide residue analysis. All the facilities as per international standards required for pesticide residue analysis in various substrates have been established. Most modern equipments such as UV-VIS Spectrophotometer, FT-IR Spectrophotometer, Gas Chromatograph, High Performance Liquid Chromatograph, GC-Mass Spectrometer, Rotary Flash Evaporator etc. have been procured. The laboratory is in the process of accreditation for ISO/IEC 17025 quality management system by the National Accreditation Board for Testing Laboratory (NABL, India).